The story follows after the universe is shaken out of balance because two Hypnotoads from two different realities fell in love. Now it's your job to help Fry rescue his friends, clear the Hypnowaves, and save the universe one building at a time. Worlds of Tomorrow offers you a chance to build your very own New York with your favorite characters from the show, as well as explore space, and battle other players in PvP combat. 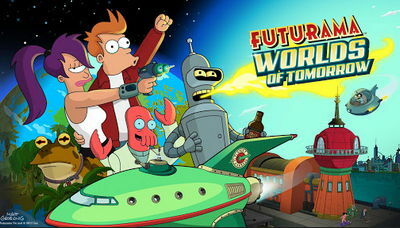 If you're into the Futurama show, quest-based sim / strategy games, city building, space exploring, PvP battling then Worlds of Tomorrow is for you. You play by tapping the screen to collect, expand, build, navigate, or fight. 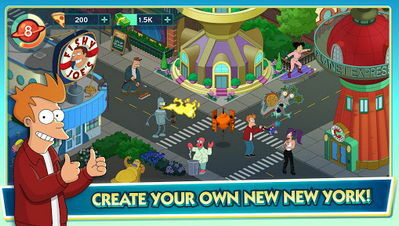 You need to complete tasks, unlock new characters and buildings, and level everything up just like in The Simpsons game. XMas has wrapped up in New New York and a New Year has begun! Join the crew in epic new battles and save the universe from the Hypnowaves! - You can also use the outfit -o- matic and skip for free. (It comes in really handy for Golden Bender)And to get cash you can get one of your characters to do an action and skip it repeatedly for free getting cash, and exp.This mod does not give you pizza, let you skip building times, or give you cash other then doing actions and skipping. Just install v1.5.3 and play. If you encounter any bugs or issues please comment. This worked for me. No free pizza or money, but could purchase buildings, characters and career chips for free. Which is fantastic. Thank you.